Yesterday I decided to leave Quartzite and the RTR site and just get away to new surroundings for the night. 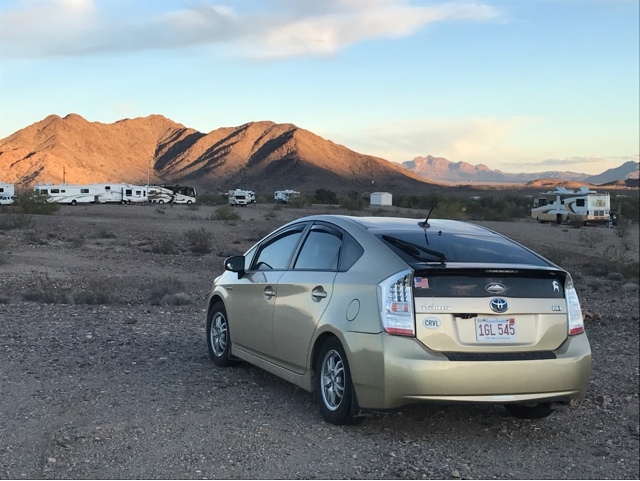 I decided on spending the night at the Slabs near Niland, California, although this is not a new place. Some RTR folks I knew and others I didn't had gone over to the Slabs so this gave me a temporary destination. Tuesday I will start heading north to a destination scheduled for Wednesday night. Just so you know I typically don't write about where I currently located for security reasons. One exception is attending the RTR as I was posting about it. Above is a so called private compound at the Slabs. Well, kind of private. People here have no rules but an understanding that if they carve out a space and delineate it with stuff, in this case old tires. It means stay out. The sky is nice after a cool windy rainy day. Off in the distance there is snow in the mountains near Palm Springs. 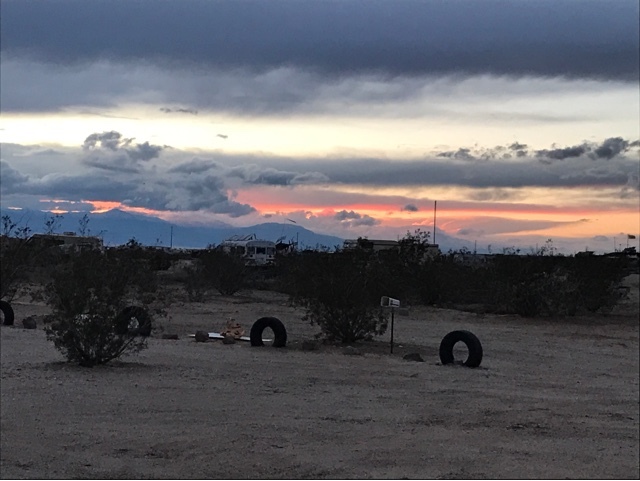 We woke up to 38 degrees at the Slabs, and although I thought about a second night I decided it was a good day to visit Los Algodones, Mexico and do some minor shopping. I passed through the famous Imperial Valley where much of the US fresh food is grown. 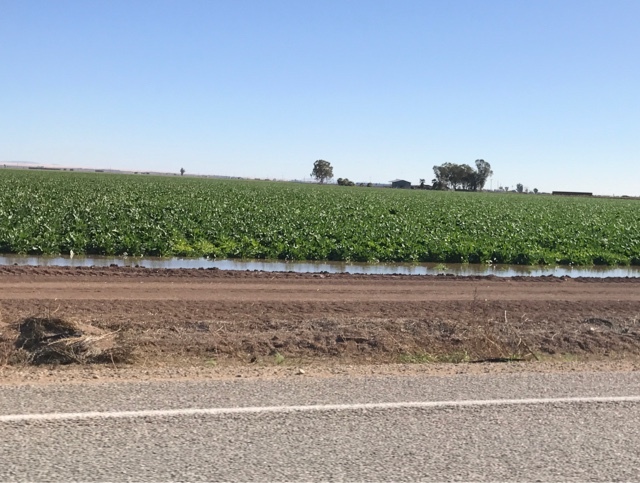 The land is irrigated with miles of canals fed by the Colorado River. 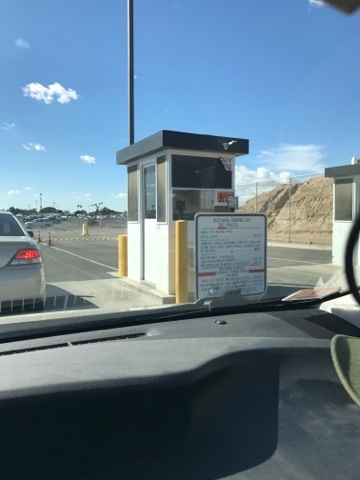 I arrived just before noon at the Indian Reservation parking lot where I pay $6.00 to park a few hundred feet from the entrance of Mexico. It takes literally a minute or two to make your way a few hundred feet through the turnstile into Los Algodones. It's only a few other feet until you have a plethora of pharmacies, dentists, and optometrists to obtain cost effective services. So many snow birds come here you will never be alone in town. The Mexicans are well versed st English too. With a quick stop at the pharmacy, and a brief walk around a block to a shop to pick up a present, my shopping is done for today. The woman I usually buy from wasn't there but on lunch break her husband tells me and being a repeat customer he treats me well with out negotiating price. Having spent less than a half hour with my purchases it was time to go stand in about an hour line to get back to the USA. See picture above. 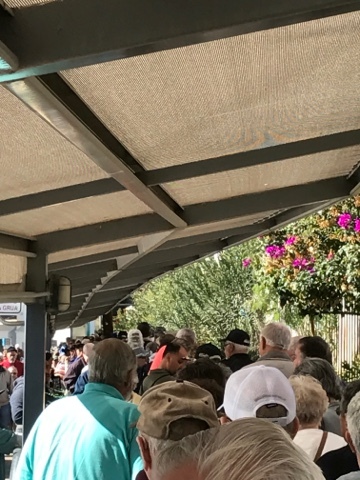 The exit line to the US is lined with Mexicans selling all kinds of things including water, green vegetables, toys, jewelry, and just people looking for your pocket change or a dollar or two. I was given a mild warning for a dirty passport card. I use this for TSA travel in airports but it couldn't be scanned today as it was dirty. He saw the sleeve that it came in sitting in my left hand and said that is why it didn't scan. 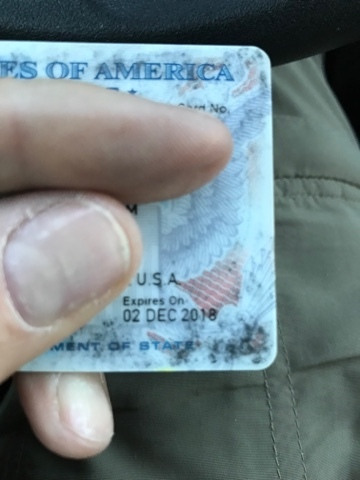 He said the metal in the sleeve is wearing off and transferring to the passport card. He mellowed a bit with me as I said it came in the sleeve and I thought I was supposed to keep it in it. He went on to say cards are no longer issued in the sleeve for the reason we are discussing, as he typed in my passport number. I can see how having to type in each card would get under their skin. Especially with a 1/8 Mike line now trailing behind me. I apologized again and thanked him and the trash was at the end of the counter and the sleeve was tossed in. He never did ask what I bought. Just what the purpose of my visit to Mexico today. I am trying out this BLM spot high up where I've never been before. I'm actually liking this spot but I don't see any trails to hike from here.